As more companies make the leap into Enterprise AI, learning best practices from others who have been there before becomes even more critical. - How these approaches ultimately affect ability to execute (as an individual, as part of a team, and as a company). This webinar will walk through some of the trends and insights from the survey paired with expert suggestions for addressing the particular challenges. Responsible AI is essential for any company that wants to have robust AI systems in place in the future. - Making sure that systems are centralized for control over data yet flexible enough to allow for innovation. - Ensuring that robust monitoring is in place for all models. - Establishing trust in people and in data. - A company-wide dedication to models that are interpretable, unbiased, and ultimately won’t cause PR and trust issues for the company down the line. Kurt Muehmel, VP of Sales Engineering at Dataiku, and guest Mike Gualtieri, VP and Principal Analyst at Forrester, will discuss the ins and outs of all of these topics (and more) for the first portion followed by a Q & A at the conclusion of the presentation. You’ll want to make sure to catch this webinar live for a chance to ask your questions about bringing responsible AI to your enterprise. We surveyed more than 50 global data & analytics leaders about their top challenges for 2019. The results reveal that there are still fundamental challenges to leveraging AI and machine learning at scale. In this webinar, we sit down with banking data leaders to cut through the hype and discuss the real barriers and opportunities towards discovering value in data in 2019. We reveal and discuss those opportunities and challenges with Victor Tewari, Technology Officer in Predictive Analytics at BMO Capital and Jimmy Steinmetz, Solution Lead at InterWorks. This live event will be ideal for technical and non-technical audiences alike. If you can’t make the live time, register anyways and the recording will be sent to your inbox. Learn about the AI trends in 2019 - what will matter in the year to come, and what won't. Leo Dreyfus-Schmidt, Dataiku AI Labs Lead Scientist, will present his take on technologies to watch as a data scientist. This presentation will be ideal for technical and non-technical audiences alike. The Chief Data Officer (CDO) role has gone from anomaly to necessity within the last five years. Find out why that is the case and how to overcome the struggles to achieve data maturity. Whether a CDO yourself, looking to hire one, or trying to evolve data systems, this webinar will offer critical insights from expert Caroline Carruthers, author of "The Chief Data Officer's Playbook," and guest CDOs (TBA). She will present current challenges (and suggested solutions) in a conversational format with a few of today's up-and-coming CDOs. Many organizations with the hope of becoming more data-driven ask the question: self-service analytics, or data science operationalization - which will get me where I need to be? And the answer is: you need both together. The fact is, it's the interplay and balance between operationalization (o16n) and self-service analytics (SSA) initiatives that makes a successful data-powered company that executes on all projects to its fullest potential. While at first glance the two appear to be completely different (maybe even contradictory), it’s precisely because they differ in value, scale, and more that they round out a complete data strategy. Join the webinar hosted by Dataiku for a look at how to implement a complete strategy for both, pitfalls to avoid along the way, and case studies of large enterprises who have successfully implemented the two. Deep Learning models can be exceedingly powerful and accurate if you are willing to invest the time to train them. However, there’s no need to waste energy on poorly framed problems or building model architecture from the ground up. In this webinar, with GoDataDriven, we’ll reveal the best practices we’ve learned from leveraging Deep Learning in a variety of real-world systems, in addition to showing you how to access Deep Learning quickly, so that you can spend time personalizing your model to provide the best business value for your unique needs. The market for big data technologies continues to accelerate as big data becomes an increasingly integral part of business operations worldwide. And, as data analytics tools and solutions have matured, businesses have been able to leverage the insights from their data at a faster pace than ever before. Discover the ways in which businesses are applying their big data insights to achieve real-world results. For projects employing machine learning or deep learning, the acid test doesn’t come from making that first “win.” Instead, the true test is making successes from embracing AI consistent and repeatable. Like most new technology innovations, for AI, the spotlight has initially been on the technology. Because the AI practice in the enterprise is still in its infancy, there is less knowledge about the “soft” side: understanding how to build the teams of people that make AI happen and creating the processes that can make success repeatable. 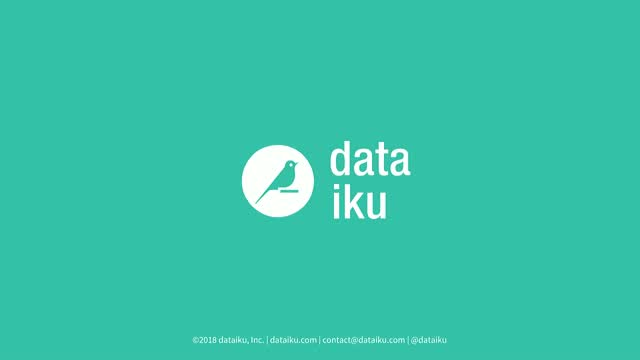 Dataiku and Ovum are collaborating on a jointly sponsored primary research study to address the knowledge gap on “the soft side” of making AI work for the business, conducting a qualitative survey of specially selected leaders and practitioners in the field, including chief data officers, chief officers and directors of data science, and chief officers and directors of analytics. Tony Baer and Florian Douetteau summarize the lessons learned from this research and identify best practices for ingraining AI into the business, based on actual experience in the field. - What exactly does it mean to do Enterprise AI anyway (and how is it different from regular AI)? - How does Enterprise AI connect to machine learning and deep learning (and what's the difference)? - What are the challenges, risks, and benefits to getting started on Enterprise AI now? This webinar will answer these pressing questions. Presented in a conversational format, Mike Gualtieri, VP & Principal Analyst at Forrester, and Florian Douetteau, CEO at Dataiku, will address these points by way of case studies (i.e., what real companies are doing right now in this space) plus discuss how those who haven't started can dive in. Many teams around the world have already used Dataiku to collaboratively design and prototype data workflows and machine learning models. But what about taking the next step - putting this work into production? Jed Dougherty, Lead data scientist for Dataiku's US team, will describe a complex production implementation that he helped a major US firm design and deploy in only 10 days. He'll dive into the technical and business-level details of deploying thousands of models to live endpoints, and perform a quick live demo of what this process looks like inside Dataiku. This talk is part of the EGG UK 2018 Conference. Alexandre Hubert, Data Scientist at Dataiku, recently launched a side project called Human or Company: a web page where anyone can enter a Twitter username and instantly determine whether that username belongs to a person or a company. In this talk, he explains how he created the model behind the algorithm, the features that influence the classification, and how he built the site to respond to real-time requests. Although this is a low-key and modest side project, it is a great example of building a real-time prediction service with advanced analytics, and it's a way of showing that trendy terms like machine learning or artificial intelligence can be used in simple and small (but effective!) ways. While virtual assistants have never sounded more human and as cars become driverless, companies still have to deal with a massive amount of mail. From unsolicited mail and bills to registered mail, mail processing solutions are a necessity. In an effort to bring AI to mail processing, we will present a prototype we've developed for a client in the insurance industry. Using Computer Vision and Deep Learning techniques, it automatically processes typed and hand-written letters to send them to the correct department within the organization. Customers like Unilever, GE, BNP Paribas, Santander use Dataiku to ensure they are moving quickly and growing exponentially along with the amount of data they’re collecting. By removing roadblocks, Dataiku ensures more opportunity for business-impacting models and creative solutions, allowing teams to work faster and smarter.